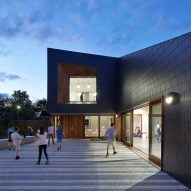 Recessed windows set into the facades of this youth centre in the English town of Tadley feature faceted timber-lined frames that contrast the building's dark fibre-cement cladding. 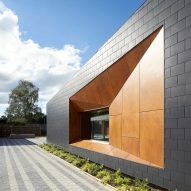 Ayre Chamberlain Gaunt, an architecture practice based in nearby Basingstoke, designed The Point to provide the local community with facilities including multipurpose halls, a music room and recording studio, a cafe and an outdoor recreation space. 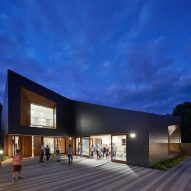 The 410-square-metre building was designed in collaboration with the town's young people, who use the building during weekday afternoons and evenings. The wider community has access during the daytime and weekends. 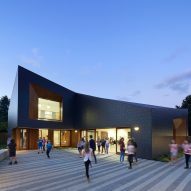 "We worked closely with the young people of Tadley to develop a sculptural design that is a landmark building for them and the wider community," said architect David Ayre, "but more than that, it's somewhere they can truly call their own." The centre is located on a previously empty plot beside an existing 1980s community centre. Its L-shaped plan flanks an entrance courtyard, which is paved in stripes of alternating light and dark grey slabs. The building is intended as a "modern and playful" complement to its neighbours, with a roof that slopes down at the rear to prevent overshadowing adjacent properties. At its highest point, the facade overlooking the courtyard contains a picture window with wood-veneer lining its faceted frame. A similar opening on the ground floor provides a view into the main hall. 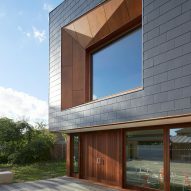 Timber is also used for the entrance, and to frame sliding glass doors that connect the ground-floor spaces with the courtyard. 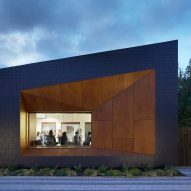 The wood provides a warm contrast to the dark fibre-cement panels that extend across the walls and roof. 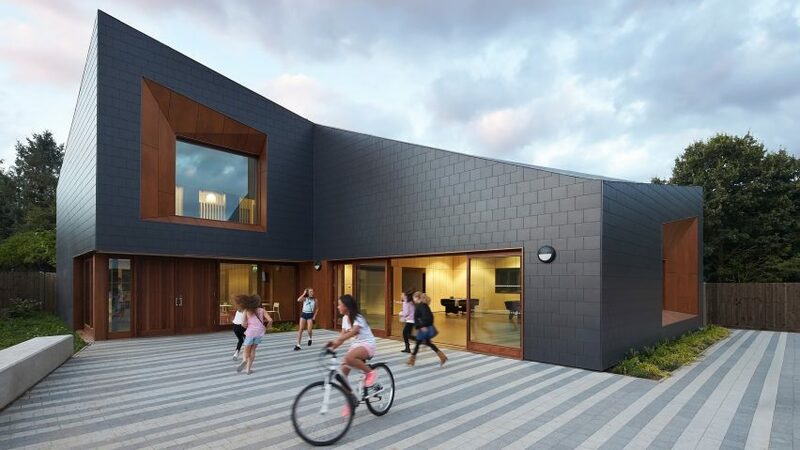 "The roof, with its dark folded 'cloak' appearance, gives the building a contemporary edge, while internally a series of uplifting spaces create an environment the young people want to use everyday," said Ayre. 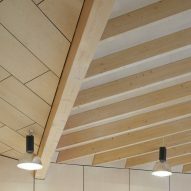 Inside the centre, walls and ceilings are lined with birch-faced plywood that lends the spaces a bright and warm appearance. 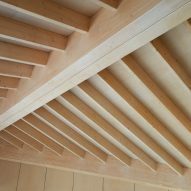 The ceiling's angular form is emphasised by its exposed laminated-timber beams. As well as the main hall, the ground floor accommodates a large reception area containing a cafe, with a kitchen and bathrooms to the rear. A staircase ascends behind a slatted wooden screen to the level above. A music room and recording studio, meeting room, multipurpose hall and breakout spaces are housed on the upper level, while a spine containing storage and secluded activity pods occupies the space at the junction of the two wings. The new external recreation area is lined with a long concrete bench and creates a connection between the existing community centre and The Point.